At the end of the first novel, Feyre dies, and all of the High Lords, present at the moment of her death, help re-make her. She is brought back to life, but it is as an immortal, not as a human. This novel is about Feyre’s internal struggle. She killed others in order to save Tamlin, and the Spring Court, but in her mind, she can’t seem to wipe that blood off her hands, a la Lady Macbeth. Out, Out damn spot! She returns to the Spring Court and just starts to waste away. Tamlin, who I loved in A Court of Thorns and Roses, has become someone I don’t recognize. I described their pairing in the first book as a little bit Beauty and the Beast, but in this story, he is all beast. Luckily, he is only in a small part of this book and I was able to put aside this jarring change, at least for a while. 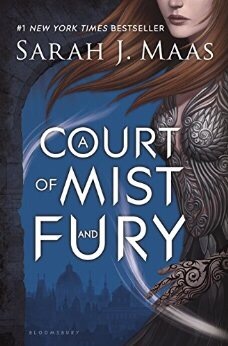 This novel focuses on Feyre, her relationship with Rhysand, High Lord of the Night Court. The bargain she struck with him during her trials against Amarantha in the first novel, is what ultimately heals her, or at least sets her on the path to inner healing. At first she uses that one week a month claim he has on her to eat and sleep, but eventually she uses it to escape. It is interesting how this author gives these characters and the plot such subtle twists. When a mystery is unveiled, I would think back to earlier scenes and see things in a truly different light than I had read at the time. This novel came through with the promise A Court of Thorns and Roses made to us, and boy, did it deliver on that promise!